Paul Krugman claims that should the much-dreaded bond vigilantes show up, they actually would be good for the economy. He notes that unlike Greece, the United States has its debt denominated in its own floating currency. Consequently, the appearance of bond vigilantes would lead to an expansionary decline in the value of the dollar, not a contractionary rise in interest rates. Tyler Cowen is not buying this story, but Nick Rowe sees some merit in it. I do too, but from a slightly different perspective. Currently, investors around the world have their portfolios inordinately weighted toward safe, liquid assets. This is because of the ongoing economic uncertainty caused by the Eurozone crisis, fiscal cliff, China slowdown, etc. They also have a seemingly insatiable demand for these safe assets as evidenced by the ongoing decline in their yields across the globe (see below). These developments, however, mean that investors are avoiding higher yielding, riskier assets more so than normal. Consequently, these unbalanced portfolios are suppressing asset prices, keeping household balance sheets weak, and ultimately are holding back robust aggregate nominal spending. Another way of saying this is that risk premiums are currently too high relative to fundamentals. The appearance of bond vigilantes would indicate their economic outlook has changed and are in the process are rebalancing their portfolios. This rebalancing, whether it was driven by higher expected inflation or higher expected growth, would catalyze more aggregate nominal expenditures and given the significant economic slack, more real economic growth. The problem, as noted by Nick Rowe, is that we want some portfolio rebalancing, but not too much That is why an nominal GDP level target is important. It would clearly set expectations on how much nominal income growth and, by implication, how much portfolio rebalancing would be allowed. In other words, a nominal GDP target would guarantee we get the just the right dose of bond vigilantism needed to shore up the recovery. 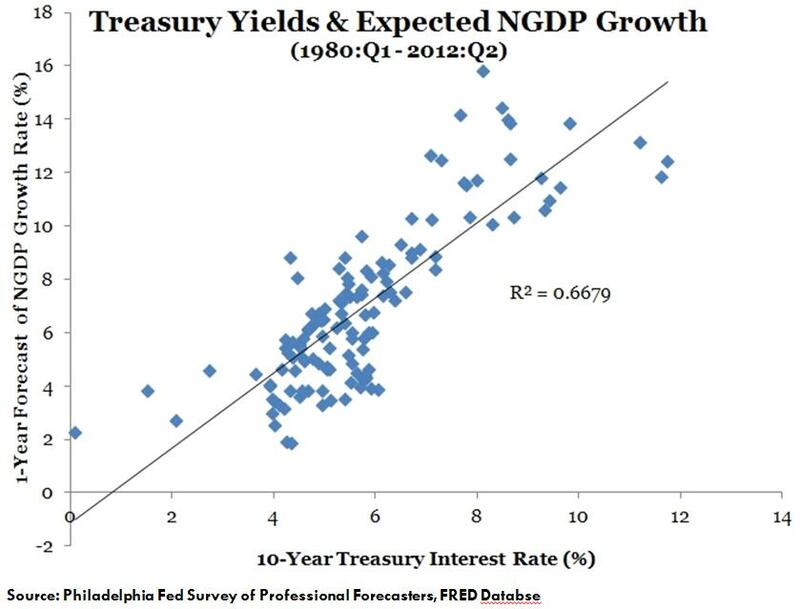 And note that the recovery in nominal GDP would push up interest rates too. Using Paul Krugman's terms, this would be an expansionary rise in interest rates. So let's not fear bond vigilantes, but learn to manage their expectations in a way that will spark a real economic recovery. Update: Just to be clear, the expansionary rise in interest rates does not mean the Fed would raise rates before the recovery. 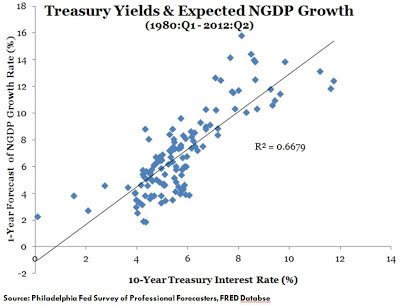 Rather, recovery would naturally cause yields to rise (i.e. demand for credit increases, desired savings falls) and the Fed would respond by raising its target federal funds rate. For more on this point see here. Update II: Further thoughts on bond vigilantes here. David: Yes, i think this is the right way to look at it. 3. The return to normal confidence in assets other than government bonds and money. Great analysis. Currently featuring your post and blog at fifthestate.co - Home of the financial, investment, and economic blogosphere. Thanks for all your contributions. Nick: but number 3 should ne our objective. Return to normal is not frightening to the public. They are the one who needs reassuring. Interesting post -- you're effectively arguing that there will be stimulus from a combination of portfolio balance and wealth effects. I think I see this differently. If you're curious, I wrote a post here: http://bit.ly/RVnba0. So you assume that if vigilantes drive people out of Treasuries, they will move to riskier assets, instead of finding another way to hoard? Saturos, the reasons vigilantes would leave Treasuries in the firs place is (1) expectation of some kind of government default or (2) expectation of higher risk-adjusted return on other assets. Default for the U.S. government really means higher expected inflation. Thus, both higher expected inflation and higher real returns on other assets would create the positive portfolio rebalancing. Saturos, let me say it this way. The premise of the Krugman-Cowen conversation is that there would be a rise in the risk premium. I think that premise is wrong. 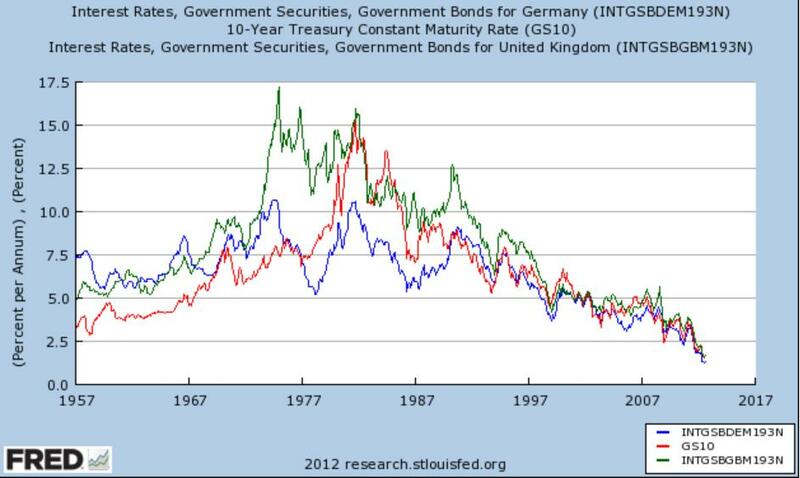 Bond vigilantes' actions would actually lower the risk premium by helping stoke a recovery. Portfolios are currently in treasuries because the risk-adjusted real returns elsewhere are negative. Reducing the risk-adjusted real returns to treasuries (by increasing the risk of default and/or inflation) will only further depress returns on equities. At the moment, treasury returns are marginally positive; turning them negative will not force portfolios into equities but instead elsewhere. Crickey, almighty, everyone is being way to namby-pamby. Print (digitize?) more money, and lots of it. Let it rip. Scott Sumner says the Fed should buy $50 billion a month in Treasuries, but raise that amount every month until we see nice solid NGDP growth. In other $50 billion this month, $70 bil next, $90 bil, etc. The timidity, the fine-tuning, the hide-and-seek, the peek-a-boo, the lack of transparency and accountability is making for creepy and small Fed policy. I have a better idea: The Fed says it will buy $50 billion a month in Treasuries, and raise it by $20 billion monthly, until we get 8 percent nominal GDP growth for four straight quarters. Bang bang, end of story, and place your bets on property, equity or bonds as you see fit. The Fed makes its FOMC meetings public (broadcast on CSPAN), and answers questions submitted by e-mail and selected by an independent moderator for a one-hour session at the end of each FOMC meeting. Why is secrecy a terrible way to govern, except when it is the area of expertise in which you are an expert, in which case secrecy and experts are the answer? Good thing you're as far away from the printing press as you are from sanity. 1. Bond Vigilantes unloading what they have – and the Fed buys more driving down yields. The money moves to next safest asset, there is no positive assumption of growth. This continues until Fed is buying 100% of Treasury debt. Morgan, the Fed is buying a large share of longer-term treasuries but still only holds about 15% of total treasuries. So there is a long way to go. Regardless on the numbers, though, the Fed would not continue to buy treasuries if a strong recovery takes hold. My argument is that the the reason a recovery has not taken hold is that demand for safe assets remains elevated (i.e. portfolios remain overly weighted to low yielding, liquid assets). A treasury sell off would change that and start a recovery, since the only place treasury holders could go with their funds is into other riskier assets. That would start the rebalancing and recovery. But a recovery would also mean the Fed would no longer need to buy long-term treasuries. David, I think you truly believe that taking greater risk = growth. It is hard to understand who someone who spent a bunch of time in the private sector would make such a mistake. Growth - the Real kind, not the Nominal kind, comes from technology / market advancements that free up resources WHILE STILL delivering the old level of value (in an apples to apples comparison). And while it is true that a certain amount of risky plays made by entrepreneurs are IMPERATIVE. The reality is too much $$$ chasing too few risky investments actually HURTS productivity gains, because the bubble forces even the very best players to over-raise, over-hire, and causes confusion in the marketplace.... too many confusing choices limits consumer adoption in network effect stuff. The REASON I am attracted to 4.5% NGDPLT is the calming influence of limited capped growth, that only lets the better entrepreneurs play the game, and only puts a limited number of options in front of consumers, and keeps labor just hungry enough that they don't get big eyes, and only convinces a certain amount of capital there is only a certain amount of upside. So when I say the BV are going to look for the next safest asset, as the Fed buys more and more of the T-Bills, I don' really think any of it starts a new car company, a new genetics lab, or anything that really means to make productivity gains. It'll EXPRESSLY be trying to not do that. So not only do I think your idea is unlikely, I think it is bad if true, because the new things that money tries to create WONT WORK. Assume all the risks you cheer won't work, still think they are good? If however you said we are going to let evil oilmen put a dirty oil rig on every piece of federally owned land including the white house lawn, THAT would be a productivity gain. And no money need to be printed. Do you HONESTLY believe it isn't possible to de-regulate our way to full unemployment? You might not prefer it, but do you think it is not possible? If interest rates on Treasuries, say, double (leaving them still "low"), what happens to the US fiscal position? Do we get enough additional tax revenues/lower spending from higher growth that it's a wash?